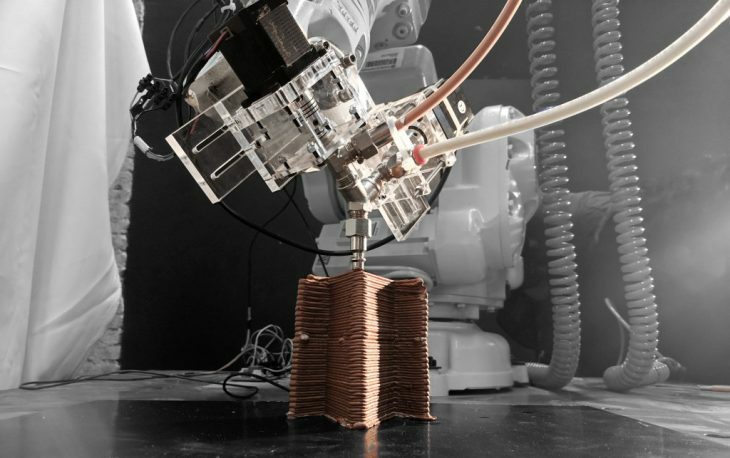 Functionally graded materials (FGMs) open the possibility to carefully design the clay material distribution over geometries, taking advantage of the wide pallet of material available to build architecture. The relation between form and material distribution have structural, economic and aesthetical implications yet to be explored. Functionally graded materials (FGMs) are heterogeneous with respect to its composition (based on the additive) throughout the geometry. Anisotropic is the property of being directionally dependent, which implies different structural properties in different directions. For instance, compressive and tensile strength in the designed geometry shows obvious anisotropic behavior which is inherent to additive manufacturing. The research aims to apply the functionally graded materials (FGMs) design principles which are deduced from the workshop3 Materiality challenge in the future design which respects to the structure, economic, and aesthetic. However, the manufacturing apparatus for FGMs is not able to fulfill the ongoing requirement in controlling the material extrusion and distribution. Therefore, the present materials that have been used do not represent the accurate materiality and the deduced result are remaining hypothetical. All the research method had been conducted in the conditional boundary: X = 100 mm Y = 100 mm Z = 200 mm. For more detailing geometry catalog please refer to Workshop3 Materiality Challenge. The geometry catalog was developed in numerous cantilevered surface and volumes, to explore the ideal linear distribution of material with different densities. Selected surface iteration from density catalog and create a catalog of surface patterns representing an ideal distribution of matter with different compressive and tensile strength. Selected surface iteration from density catalog and create a catalog of volume patterns representing an ideal distribution of matter with different drying and shrinkage property. 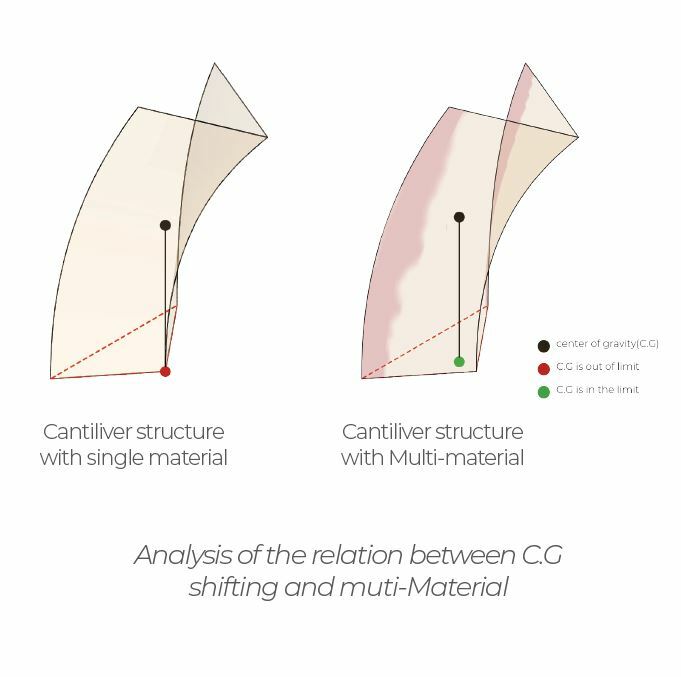 In FGMs printing, greater structural stability can be achieved by designing the placement of materials having different densities. Moreover, compressive strength is directly proportional to the density of the gradient material usage. The following diagram reveals the concept of gradient material optimizing the structural performance of the geometry. The FGMs shows anisotropic behavior with respect to compressive and tensile strength as an inherent property of the additive manufacturing method of fabrication. For instance, the gradient material has a high compressive strength in all axes, it has a high tensile strength in x and y directions but very low tensile strength in the z-direction. Unequal drying times between the shell and infill may lead to cracking and result in lower structural strength of the object. On the other hand, sufficient tolerance must be provided in the design to account for shrinkage and prevent cracking to avoid structural damage. However, in general, drying times do not have a high positive correlation with shrinkage but with gradient material composition. Additionally, shrinkage reveals a similar phenomenon. 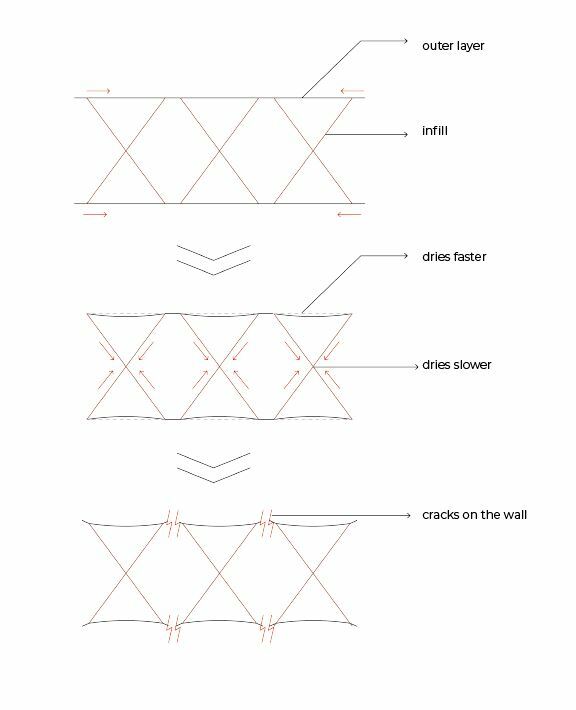 The following diagram indicates the situation of shrinkage leads to the overall cracks and structural damage.